Since tomorrow is Easter, I thought it would only be fitting to talk about a movie of the religious variety and since TCM is showing Godspell on Easter afternoon (3/23 at 3 pm), it was kind of a no-brainer. 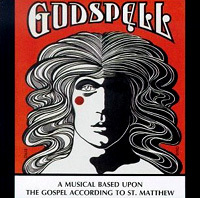 I saw Godspell (1973) for the first time sometime last summer. This may sound a bit flippant, but I only watched it because I wanted to see what Victor Garber looked like, or as I called him, “The guy who played the girl’s father on Alias.” No, I’m not an Alias fan, but on a few occasions, I was forced to sit through a couple of episodes with my friends. My plan was to see what he looked like when he was younger (doesn’t everyone like to play that game?) and then watch something else. The idea of hippies dancing around and singing about the Bible wasn’t exactly my cup of tea. As a side note: I should state here that I do identify myself as a Roman Catholic, although I’m not a very knowledgeable one. I went to public school and was forced to take some religious classes when I was around 7 years old. I took Religious Philosophy when I was in college, but quickly dispensed everything I learned once my exam was over. Not much has stuck with me, although I know the basics. It’s not very popular to talk about God in some circles, and I can fully admit that I flirted with atheism about two years ago during a very rough patch in my life (although it was more of the “Are You There God, it’s Me, Margaret I’m not talking to God, so there” variety). Things have happened in my life that have changed that opinion and I can proudly say that I believe in God now. But I also believe in not shoving your beliefs down people’s throat and being overly judgmental about things. One of my favorite sayings is the old standard: “He who is without sin, shall cast the first stone.” I hope no one thinks less of me because of this. Thankfully, I do like religious movies–King of Kings, Barabbas and Godspell are my favorites. But John Huston’s version of The Bible (1966) has always creeped me out and whenever I see it on tv, I run screaming from the room. Mainly because I was stuck somewhere two years ago and that was the only movie being shown on the in-house tv station. Not once, twice or three times. But FOUR times a day! Anyway back to Godspell. Part of its appeal is the music, which was all written by Broadway composer Stephen Schwartz. While the songs sound distinctively 70’s (they wouldn’t sound out of place on your local lite FM station), they’re also really catchy. One of the most popular songs, “Day by Day” (sung by Robin Lamont, who was also in the original cast) is particularly beautiful. There are some other great songs as well, like the two I’ve included in this post: the upbeat, “Light of the World” and the gorgeous, “Beautiful City.” The latter was specifically written for this film version, while two other songs, “We Beseech Thee” and “Learn Your Lessons Well” were omitted. Also, look out for the ending of “All For the Best” which ends with the cast members dancing atop of the World Trade Center. My aunt has a copy of the original soundtrack and every time I would flip through her albums, the cover scared me. I’m not sure why, although it’s worth noting that everything scared me when I was a kid. One really interesting note is that Victor Garber came from the legendary 1972 Toronto production, which is also notable for launching the careers of Eugene Levy, Andrea Martin, Martin Short, Gilda Radner and Paul Shaffer of David Letterman fame. This site is completely devoted to the Toronto production and it’s really worth checking out. Lots of reviews and pictures ahead. Godspell certainly isn’t everyone’s cup of tea. In fact, there are some people out there who will probably roll their eyes and recoil in horror at a movie like this. Like a lot of 70’s movies, it’s certainly dated, but if you’re into religious movies and give it a chance, I think you’ll enjoy it. It’s fun, has a good message and has a great soundtrack–there’s a lot to like. And for those who celebrate it, Happy Easter! And don’t go overboard on the chocolate. Nothing says “a good business idea” like a Network parody. That’s right. It’s a Network (1976) parody. The first time I saw it, I was a bit dumbfounded, the second I couldn’t stop laughing and by the millionth, I was completely bewildered. Honestly, what marketing genius thought: “Hey! You know what we should do for our next ad? Make a parody of the ‘I’m as mad as hell and I’m not going to take it anymore!’ scene from Network. What a GREAT IDEA! And while we’re at it, let’s get some horrible actors to open the windows and scream some lines.” Kudos to the guy shaking his hands at the end. Seriously, give this man an Oscar! What are the odds that a movie about commercialism, ratings drama and network broadcasting would spawn a commercial that parodies one of the most pivotal scenes in the entire film? It’s so absurd, it could be playing at the end of the film along with the news report about Howard Beale’s death and the cereal commercials.